(VEN) - Pigs are everywhere in Vietnam these days as the country prepares to celebrate the Year of the Pig, which starts on the Lunar New Year, Tet, in early February. The pig is the 12th and last Chinese Zodiac sign, after which the yearly cycle begins once again with the mouse, followed by the buffalo, the tiger, the cat, the dragon, the snake, the horse, the goat, the monkey, the rooster, the dog, and the pig. People born in the Year of the Pig are considered generous, gallant, kind-hearted and bold, but also stubborn and temperamental. The Chinese zodiac, observed in other parts of Southeast Asia such as Vietnam, is also reflected in Dong Ho folk paintings that date back to the 12th century. The woodcut paintings were traditionally sold or displayed on Tet, although the art is virtually extinct except as tourist souvenirs. Dong Ho painting originated in Dong Ho Village on the left bank of the Duong River in Bac Ninh Province, about 35km from Hanoi. We came to find artisan Nguyen Huu Qua, the son of the late artisan Nguyen Huu Sam, who dedicated his life to the development of the traditional craft. In the process of drawing one of the best-known renditions of Dong Ho painting, the family of the Yin-Yang pigs, Qua told us about the meaning of the folk painting. 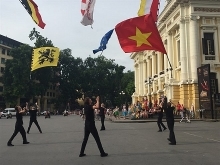 According to Qua, the dream of every Vietnamese, especially those living in rural areas, is to have a prosperous and peaceful life. Thus, the pigs in Dong Ho folk paintings are always round and fat, expressing prosperity and wealth. The painting also represents the wish for a new year of contentment, so all the paintings feature bright colors and humor. The Yin-Yang pigs depict a family of piglets clustered around their mother. One is climbing on her back, another is snuggling up to the mother, and yet another tries to eat sweet potato leaves. Dong Ho paintings, in general, are an animated reflection of real life and of people dreaming of a better, happier life. 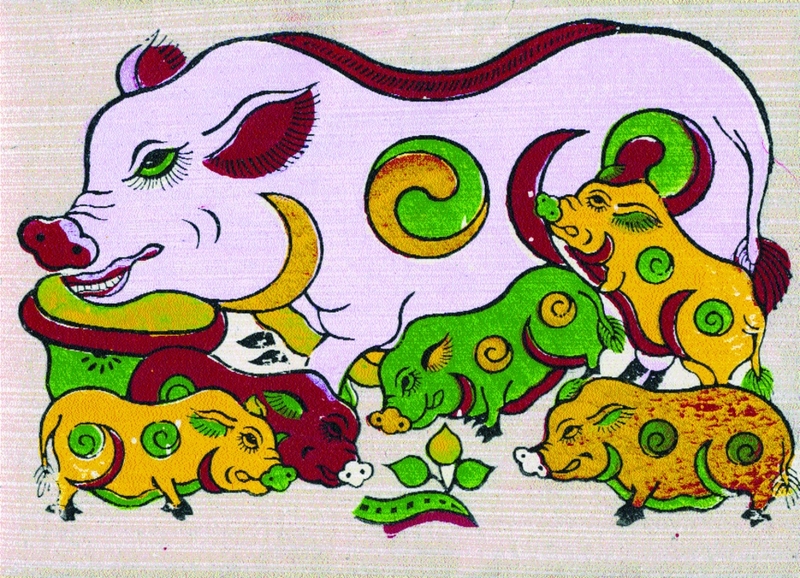 Pigs are also depicted in Kim Hoang folk painting that originates in Kim Hoang Village in Van Canh Commune of Hanoi’s Hoai Duc District. Kim Hoang paintings are called red paintings because they are printed on scarlet paper. The paint is made from minerals, lending the images a natural, clear look. Many of the paintings feature poems or vertical sentences written in Chinese characters. According to Tran At from Kim Hoang Village, the combination of printing, coloring and drawing techniques gives Kim Hoang paintings a soulful look. The pigs have a unique look, with black bodies and white contours, against a red paper background. The art of making Kim Hoang paintings is still considered a symbol of traditional Vietnamese culture and aesthetic values. The image of the pigs is also used on Bat Trang ceramic plates, wooden cutting boards, and block calendars. These variations on the original are a way to revive the Kim Hoang paintings that became all but extinct in the middle of the 20th century.